Have you ever found yourself looking at a deal in Pipedrive only to get that nagging feeling that you’re missing something? You might have a vivid memory of communicating with the customer and reaching some agreement, or deciding on a plan of action, but because you have 50 other clients you’ve completely forgotten exactly what it was? So you fire up the old email client and what’s this? 45 unread emails. A quick scan shows some are from the boss, some from clients, and some from names you don’t even recognize. You quickly open one of the emails from your boss, just to take a peek, and it’s urgent. So you start responding to just the one email. When you look up the next time it’s 45 minutes later and the original deal you were working on has been completely forgotten. Pretty soon you’ll see the deal rotting alert next to this and other deals, and that’s something no one needs or wants to see. You have workarounds but it’s not the same. Wouldn’t it be great if all email correspondence around deals or contacts was right there in Pipedrive; linked, organised, and available at the click of a mouse? Wouldn’t it be even better if you could send a response without navigating away from that deal or contact page at all? remove the frustration of constant cross referencing. 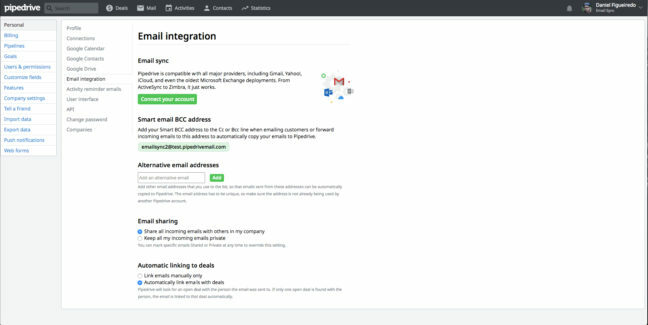 Now you can connect your email tool of choice seamlessly with Pipedrive. 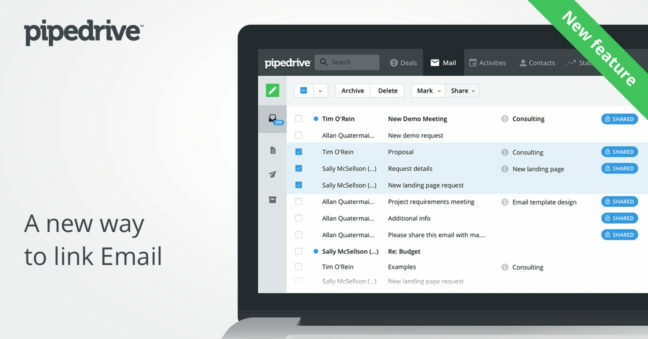 This means you can send email from Pipedrive that will also appear in your email tool. Conversely, anything you send from Gmail.com or an email client such as Microsoft Outlook, will be automatically logged in Pipedrive, attached to the contact or deal of your choice. Everything in one place, just as it should be. No more switching back and forth between Pipedrive and your email, frantically trying to align deals and communication, because we know that nothing breaks your concentration like leaving Pipedrive to go check another application. So we’ll save you a whole whack of time and increase productivity, all in one fell swoop, while making sure all the information you need is captured securely inside Pipedrive. Deal information is often sensitive, and sales people are naturally competitive. As a sales manager, you may want to control the information flow inside your business tightly. We’ve made provision for this. While the default setting for email sync is ‘shared’ you can choose ‘private’ if you’re feeling secretive. 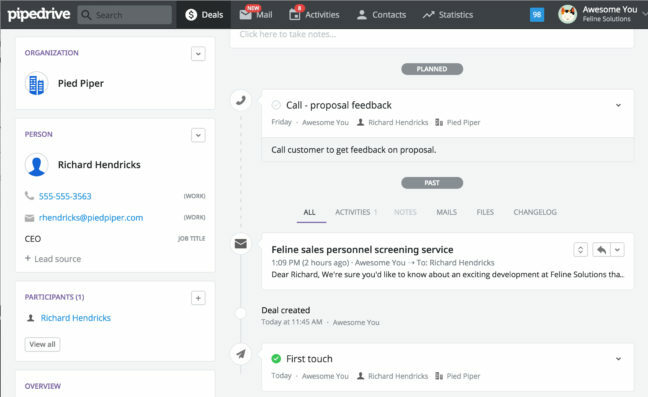 In addition, if an email is not linked to a deal or contact, your team members will also not be able to see it. This also means that the mails you see inside Pipedrive are pertinent and meaningful. No email noise, no clutter. Just the deals and contacts and the emails directly involved with them. This leads to increased productivity and a smooth sales process. You may be the rare modern salesperson who doesn’t rely that heavily on email and sends only a couple a day, or you may even enjoy the challenge of multi-tasking between platforms. 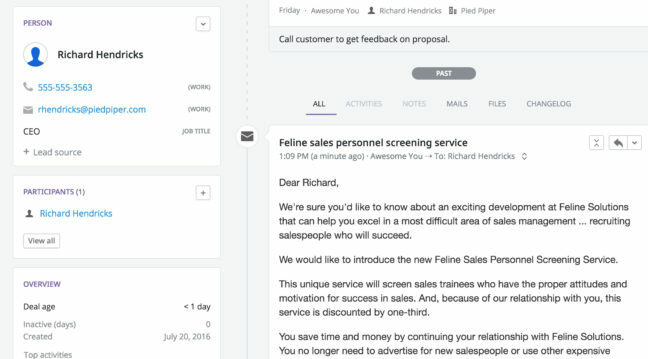 Our existing Smart Email Bcc feature is the perfect solution for low volume sales teams. It allows you to easily copy emails to Pipedrive deals or contacts. With Smart Email Bcc You get a personal companyname@pipedrivemail.com email address you can Bcc, no matter which email provider or client you use. If you’re not using this feature yet, you can get a full tutorial watching this great video. Smart Email Bcc is our default solution and is available to all users on the Silver plan. Simply go to the mail page in Pipedrive and start Bcc’ing when sending emails. (Haven’t heard of the Silver plan? Please click here to read about our new tiered pricing system). For Full Email Sync, you’ll have to go Gold or Platinum. If you’re the administrator of your account, upgrade to the Gold or Platinum plan in the billing section. Then, once you have successfully upgraded, go to Settings > Personal > Email integration. Here you can connect your email, choose which labels or folders you wish to sync and then start syncing. While you’re in the settings page, you can configure the rest of your set-up. Auto-connect to deals, add a signature and add emails to “ignore addresses” (emails from this address will not be synced). You can also choose what to do when you Archive or Delete a thread in Pipedrive i.e. do you want the same to happen in your email client or not. This is also the time to set all emails’ default visibility to shared or private. Please remember that you can upgrade or downgrade between these two solutions at any time. Supported providers: Gmail and Google Apps, Yahoo! Mail, Microsoft Exchange (ActiveSync), Outlook.com (aka Hotmail), iCloud (aka MobileMe or DotMac), any custom account syncing via generic IMAP as well as a whole raft of smaller providers. We've also put together this handy FAQ, which should answer any questions you have regarding the set-up of Full Email Sync, while this Tiered Pricing FAQ elaborates on the new plans.